Home consumer research consumers Marketing Do Your Products Meet Your Customers' Values? Do Your Products Meet Your Customers' Values? Many times when we introduce our products to the marketplace,we don't always think about how our potential customers will view the product. We may know how special our new product is, but how do we get that information to our customers? An example might be trying to sell freezer beef in the local "Penny-Pincher" paper. Most of that readership are looking for inexpensive purchases and might not respond well to the purchase price of a quarter or half of a beef. On the other side, if your goal is to be the lowest priced sweet corn producer, an up-scale farmers' market might now be your best outlet. Those customers might view your product as lower quality simply because you are offering a lower price than your competitors. In both cases, neither is a good product-place match. based on their involvement in "sustainability." The Hartman Group, who specialize in researching and understanding how consumer attitudes and behaviors lead to purchases, surveyed consumers about their involvement in "sustainability." They identified four categories - reflected in the image to the right. The "core" are those who are very involved (recycle, purchase local food, conserve energy, etc.). The "periphery" reflects those who do not necessarily go out of their way to follow any kind of sustainable practices. Notice the kind of language these groups use to reflect what they value or what is important to them when making purchases. Words such as "transparency," "greater good," and "authenticity" are the values of the "core" and "inner mid-level" groups. It's very similar to the language of the local food movement, so if you believe your product would be beneficial to this group, then think about where they might make their purchases or get their information and center your marketing efforts and materials on their values and shopping habits. 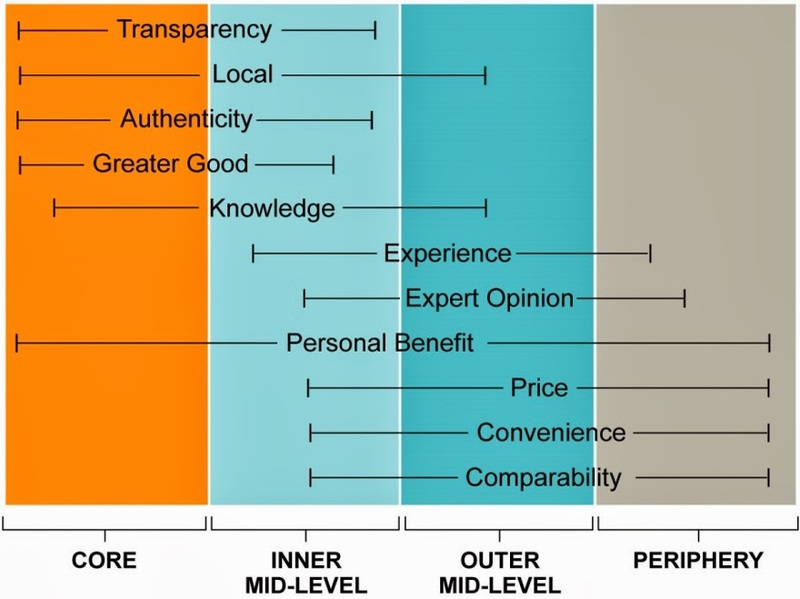 "Price," "convenience," and "comparability" are words that are used here by the "periphery" group and most closely resemble what we might see in box stores and grocery stores. If your product's benefits meet those customer needs then you will need to capture this group where they get their information and where they shop. Now, think about where you think your product falls in here and does your promotional materials and language reflect that of the group of consumers you are trying to reach. Let's say you raise grass-fed beef. 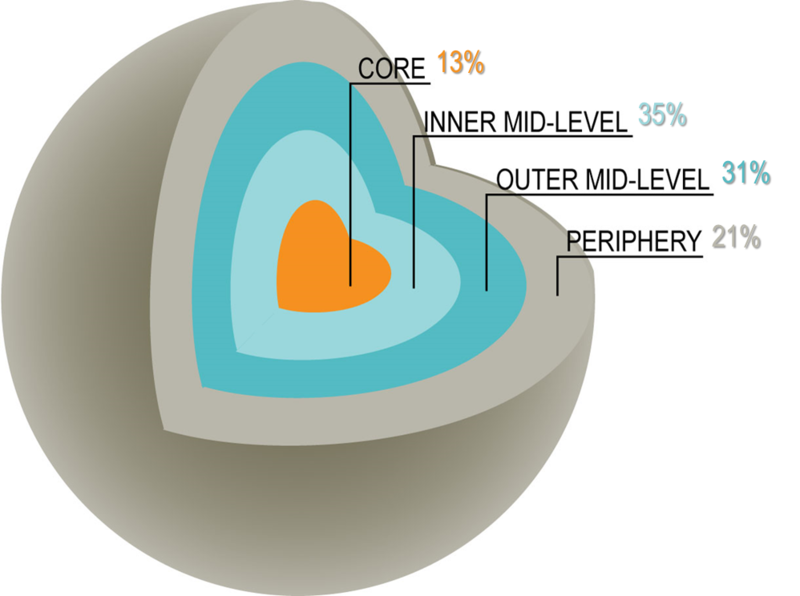 Maybe your customer base will lie within the "core" and "inner mid-level" group of consumers who are interested in a sustainable lifestyle and would most likely purchase your beef products. You need to show how authentic your products are and that your values of farming reflect their values when making food purchases. beef - "faceless" - yet still knowing how they were raised. The picture to the right demonstrates some of those values that the customer may envision when purchasing your grass-fed beef. 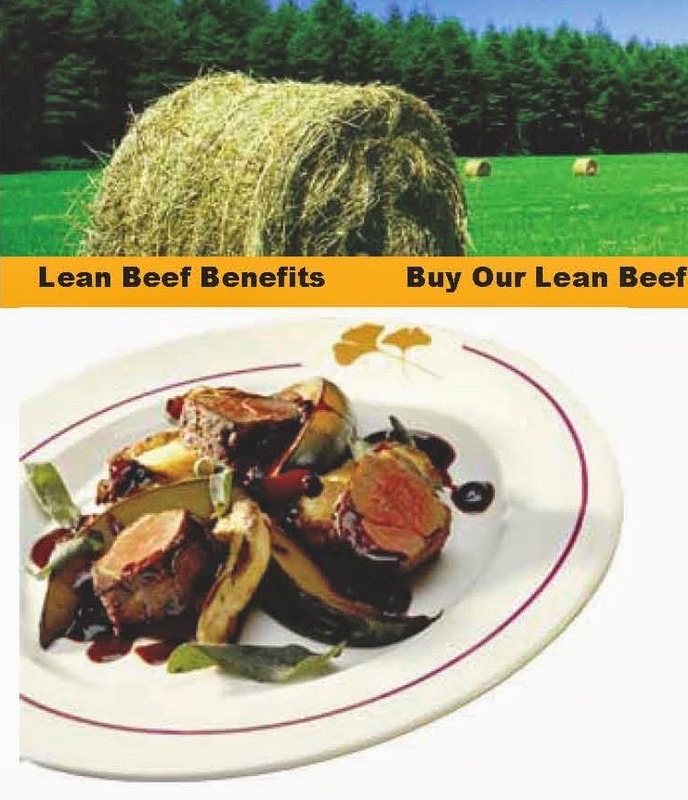 The customer wants a high quality eating experience from beef raised on beautiful pastures. The one thing you will notice missing from this ad is pictures of cows. We as farmers are greatly interested in our animals, but the customer may not be. Whether we share the same values as our customers isn't as important as making sure our products do.